Living an outdoor lifestyle is undoubtedly healthy. Although we try to incorporate lots of fresh air, sunshine, exercise and fresh food into our daily lives, more often than not we only truly experience them on our summer vacations. There are lots of ways we can create options at home, so that we can be outdoors all year round. You could even design an area of your garden to house a swimming pool. This article will look at the more luxurious additions available. At the very least it may provide inspiration for you to adapt to your own budget. Much like the fireplace in your home, a fire pit becomes the focal point for entertaining. It is where family and friends gather to eat, drink and socialize. 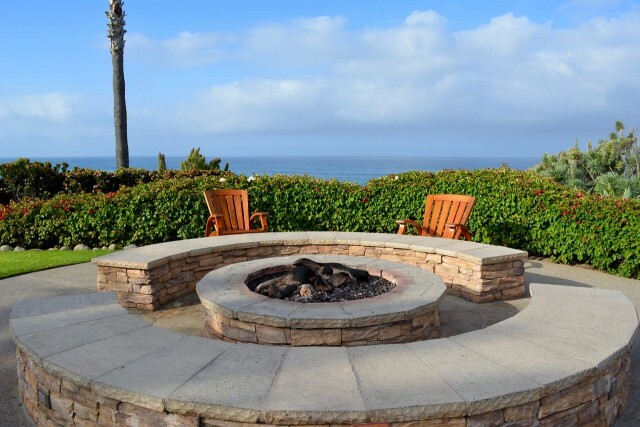 It is possible to hire the help of a design team to customize your fire pit to your garden, as well as blend in with other outdoor structures such as outdoor kitchens and garden rooms. Would you prefer a wood fueled fire pit, for a more authentic experience or do you prefer the convenience of a gas powered fire pit? There are lots of options available. If you are lucky enough to own a home on the waterfront you will want to ensure that you use your homes position to its best advantage. Lovely views from the house to the waterfront will be a priority. If you have your own boat, then it will be necessary to have somewhere to dock your boat which is in keeping with your house style. Luckily there are design teams available to help you design custom built boat docks. Ensure the view from your home down to the waterfront isn’t hindered by small windows, instead look at installing bi folding doors. Depending on where in the world you live, there will be days when the weather makes it a little tricky to enjoy your outdoor space. With the construction of a bespoke garden room, summer house or by the installation of sliding roofs and walls you will be able to use your garden year round. At the touch of a button you can totally weatherproof your outdoor space with sliding glass, in built heaters and even sound systems! This is sure to impress your guests as they relax in your hot tub gazing up at the stars, despite the weather being well below zero! No more rain showers ruining your BBQ’s! Just like your home interiors, there are many ways to bring a touch of luxury and style to your outdoor space. Design teams can help you seamlessly blend inside to outside. Individual styles can be accommodated, so that you can create a rustic country look, or sleek modern exterior. All with extras to make your life easier and more comfortable.